ST. LOUIS — Adam Scott was the last man on the driving range Sunday afternoon. Playing partner (and 54-hole PGA Championship leader) Brooks Koepka had headed to the putting green, but Scott stayed on the range until 1:42, just 13 minutes before his tee time. That was when fans began to notice something at the practice green: Scott had two putters in his bag. That's right. Scott chose to fill his bag with 12 clubs and two putters rather than the traditional 13:1 ratio. The move was reminiscent of Phil Mickelson, who carried two drivers in his bag for parts of the 2006 and 2007 season. According to the CBS broadcast, each of Scott's putters serves a different purpose: a short putter for long putts and a long putter for short putts. Doug Ferguson of the AP reported that Scott employed the same strategy at Firestone last week, but never put the short putter into play. Every golfer needs a little help on the greens. GolfLogix now offers an essential green-reading tool. Download it now! Scott began Sunday’s final round at Bellerive just two shots off the lead. The 2013 Masters Champion has explored different ways of putting since the USGA an anchoring ban in 2016. Beginning in the fall of 2017, Scott began trying the long-putter method employed by Champions tour legend Bernhard Langer. He has still had a tough time on the greens; Scott ranks just 192nd in strokes gained putting this season. Graeme McDowell was among those curious about the decision. It didn’t pay off early: Scott missed a short par putt at the first using the longer of the two. But birdies at No. 7 and No. 8 kept the Aussie in contention heading to the back nine. 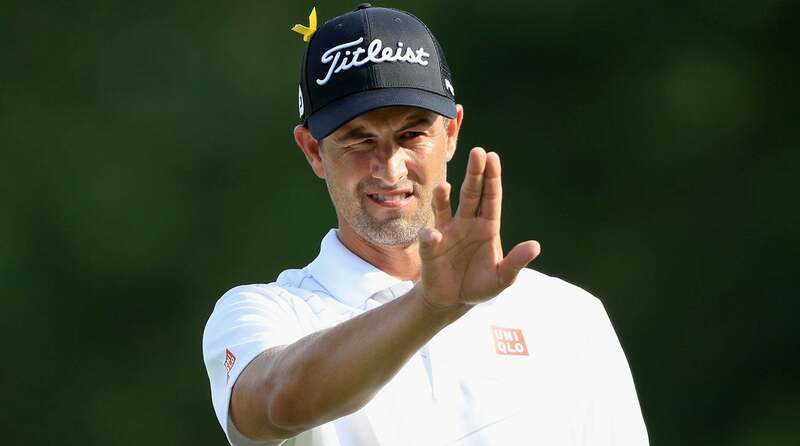 Adam Scott has two putters in the bag in the final group at the PGA Championship.